We have available the correct learning and study processes that ensure the natural talent to learn your child is blessed with is not impeded. We address, prevent, and undo if necessary, the barriers to comprehension that commonly prevent the learning of what is being presented to the student. It doesn’t take a million-dollar government funded waste of taxpayer money to conduct a research project to observe that young children learn naturally! The ability to learn is natural to us — we all have it. We see this in our children when they are young, and we instinctively know this to be true. It is why and how kids learn language the way they do! The big question is: What gets in the way? What is happening that blocks, occludes, impedes and interferes with this natural ability such that so many students have trouble learning, achieve less than they should and eventually flunk out of school? We also know, from reading or listening to the news, that those who do stay in school and graduate, have a level of passing-grade and competence in the subject matter that is questionable. The average American college graduate’s literacy in English declined significantly over the past decade, according to results of a nationwide test released yesterday. The National Assessment of Adult Literacy, given in 2003 by the Department of Education is the nation’s most important test of how well Americans can read. When the test was last administered, in 1992, 40 percent of the nation’s college graduates scored at the proficient level, meaning that they were able to read lengthy, complex English texts and draw complicated inferences. But on the 2003 test, only 31 percent of the graduates demonstrated those high-level skills. There were 26.4 million college graduates. Of the college graduates who in 2003 failed to demonstrate proficiency, 53 percent scored at the intermediate level and 14 percent who scored at the basic level, meaning they could read and understand short, commonplace prose texts. Three percent of college graduates who took the test in 2003, representing some 800,000 Americans, demonstrated “below basic” literacy, meaning they could not perform more than the simplest skills, like locating easily identifiable information in short prose. These are rather shocking facts when you consider that this is the literacy level of college graduates. Of those not getting to college, the statistics are horrific. One hears of ninety-percent illiteracy rates in some inner-city areas. Quite obviously, something is amiss in or with the system we are now using to educate our children. Something is getting in the way of our children’s natural ability to learn. Something is interfering with of our children’s natural ability to learn. Something is impeding our children’s natural ability to learn. And this is a rather recent development. The generation of “baby-boomers” now approaching retirement, and their parents, did much, much better in school than those reported on above. What we do is address this issue, and remedy it. We have the correct learning and study processes that ensure your child’s natural talent to learn is not impeded. We address, prevent, and undo if necessary, the barriers to comprehension that crop up and prevent the learning of what is being presented to the student. And we strengthen the child’s or student’s natural learning capability so he or she is impervious to being damaged by the various abusive factors in the current system. 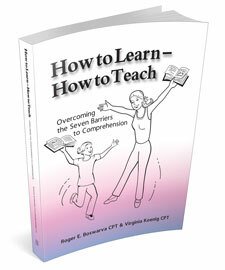 That’s what you’ll have when you act now and buy The How to Learn–How to Teach Manual & Training Material.